an Indian Agent, working as a mediator and interpreter between the settlers and Cherokees of Northeast Texas. Born in North Carolina in 1794, the son of a white mother and mulatto father (with Cherokee ancestry), Goyens’ fair complexion may have helped him establish a successful blacksmith business in Nacogdoches and begin land speculation. His work as an Indian Agent earned the trust of the Indians, the Mexican government, and the settlers in East Texas. He opened a freight hauling business, manufactured and repaired wagons, traded with the Indians, began lending money, and developed successful sawmill and gristmill operations. He married a white widow and adopted her son. Despite barely escaping being sold back into slavery on two business trips to Louisiana, Goyens owned as many as nine slaves and added to his wealth by entering the slave trade as a buyer and seller of human chattel. During the buildup to the Texas Revolution, Goyens served as Sam Houston’s, interpreter as Houston negotiated a treaty with the Cherokees that kept them from siding with the Mexican Army during the war. After Texas won Independence from Mexico in 1836, laws under the new Republic changed the status of freedmen. Many slaveholders feared that the prosperity of freedmen would encourage rebellion among their slaves. The constitution of the Republic of Texas took away the citizenship of free blacks, restricted their property rights, and forbade permanent residence in Texas without the approval of the congress. The laws became even more restrictive for free blacks after Texas annexation as the twenty-eighth state. Despite living the rest of his life in the mansion he built west of Nacogdoches and continuing to amass considerable wealth, William Goyens was forced to hire some of the best lawyers in Nacogdoches to defend against white neighbors who constantly attempted to take the property he accumulated. Goyens died in 1856 and is buried next to his wife on the property they acquired near Nacogdoches. Arnold in foreground of Joseph Musso mural. Antonio earned him a citation for his “important service.” Deaf Smith suffered serious injuries in the Texan’s fight for San Antonio, and Arnold nursed him back to health. Then, Arnold joined Deaf Smith as they scouted for other cavalry units, even infiltrating the Mexican camps with Deaf Smith disguised as a Mexican and Arnold posing as a runaway slave. 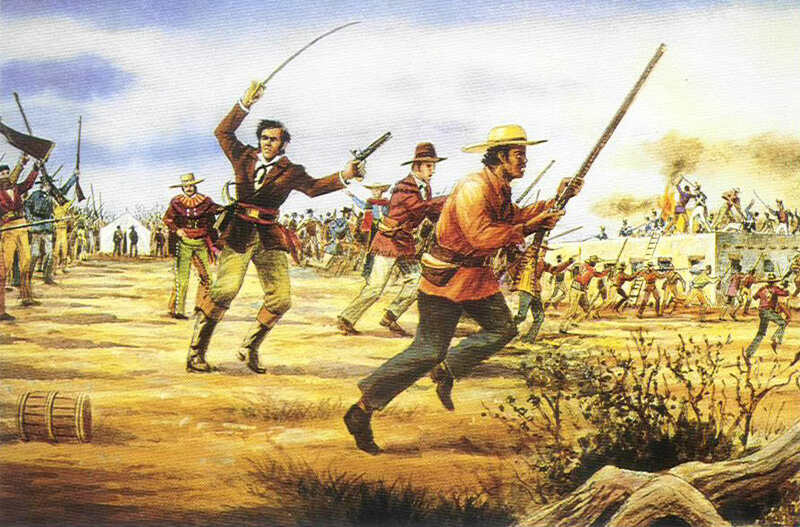 Before the Battle at San Jacinto, Deaf Smith’s spy company followed Sam Houston’s orders to destroy the bridge that would have offered escape from the field of battle for both armies, thus sealing the boundaries for the final battle for independence. Like all the men who fought for Texas Independence, Arnold was compensated in land for his service, however, his property lay northwest of present Bandera, a site with poor soil that edged Indian territory, evidence of the lower status that a free black man held in the society of that period. Arnold never lived on his land, choosing instead to live near San Antonio where he operated a gristmill. By 1827 Arnold had fathered a daughter, Harriet, with one of his father’s slaves, and despite his own status as a free black, Arnold kept Harriet as his slave. By the fall of 1835, before his participation in Texas War for Independence, Arnold had settled in San Antonio where he married Martina, the stepdaughter of Deaf Smith. After Texas joined the Union, Arnold placed his daughter Harriet, who was about nineteen, in an indentured-servant contract with James Newcomb. Newcomb was to pay $750 for Harriet’s service and then free her after five years. The Texas Black History Preservation Project points out that Arnold may have thought that Newcomb, a white man, had a better chance than Arnold of getting the Texas Legislature to accept a petition to allow Harriet to live in the state as a free woman. Before the end of the indenture contract, both Newcomb and Arnold died in the 1849 Bexar County cholera epidemic. Newcomb’s administrator successfully petitioned the Texas Legislature to allow Harriet to remain in Texas as a free woman, but Arnold’s wife (it is unclear who she was) sued the administrator for $2,000 plus the $750 due on the indentured-servant contract and asked that Harriet be returned as her slave. The results of the suit are not clear. Harriet may have been allowed to remain in Texas as a free woman.